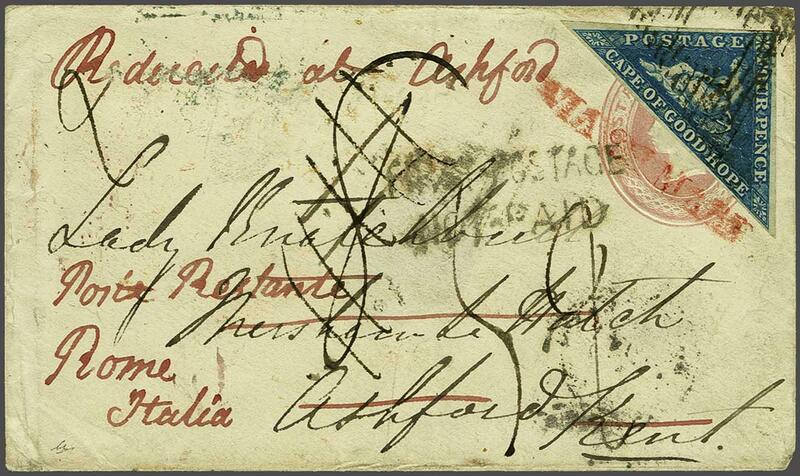 1855/63: 4 d. blue on white paper, a used example with good even margins all round, applied over Great Britain 1 d. pink postal stationery envelope and mailed to Ashford, Kent tied by CGH obliterator in black. 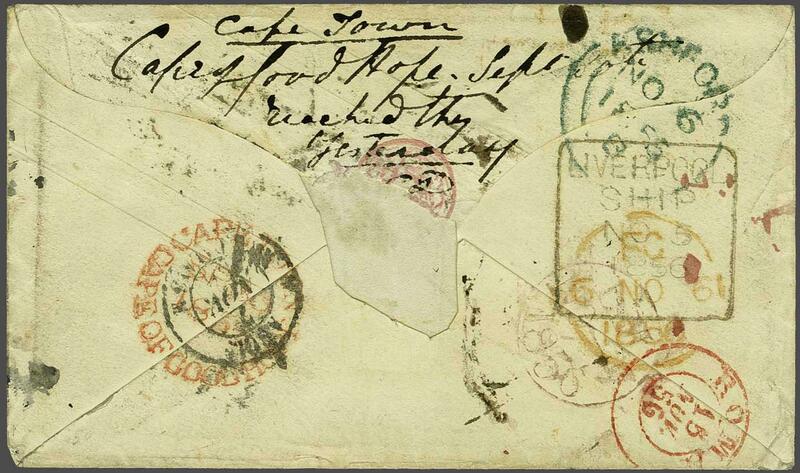 Manuscript on reverse "Cape Town, Cape of Good Hope, Sept 30th, reached this yesterday" and corresponding CAPE TOWN / CAPE OF GOOD HOPE despatch cds in red (Sept 30, 1856). Framed LIVERPOOL / SHIP datestamp in black (Nov 5) and Ashford arrival (Nov 6) in blue. Readdressed on arrival to Rome with manuscript "Redirected at Ashford", and struck with scarce instructional FIRST POSTAGE / NOT PAID in black. Straight line VIA DI MARE in red and Rome arrival cds (Nov 15) in red, where charged 59 decimi in manuscript. Small part of flap missing on reverse but a rare and most unusual cover.